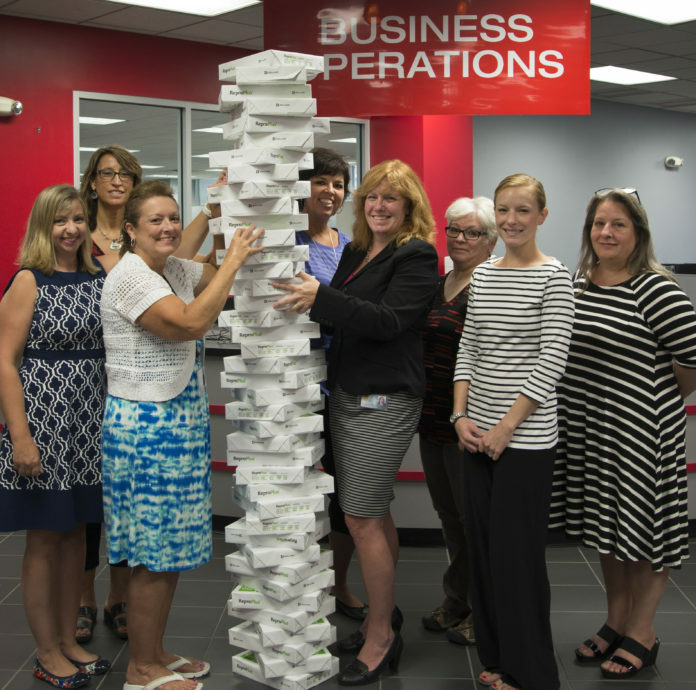 UofL's Business Operations team shows off how much paper was saved during the shared services soft launch. Since the University of Louisville started transitioning to a new shared services model to streamline transactional business processes, nearly 7 feet worth of paper has been saved. Those savings are just from the soft launch, which was between July 21 and Aug. 15. At this pace, Melissa Long Shuter, Executive Director of Business Operations, predicts that UofL will save 100,000 sheets of paper in shared services’ first year, which would be taller than Grawemeyer Hall if stacked. The new model is also projected to save about 2,280 hours of time and about $71,500 in its first year. “From the previous process to this, it is about 63 percent less time and that’s because we aren’t asking people to enter or fill out what they’ve already filled out or what we already know about them,” Shuter said. The previous onboarding process included 36 pages of information and 13 forms, for example. This meant students had to fill out their name 13 times, their Social Security number 10 times and their address nine times. Those documents were then reviewed by the applicable department and sent off to payroll. The new process includes an online form that is submitted to the Business Operations Center. That’s it. Though new, feedback from users thus far has been positive. Business Operations has conducted user surveys with a 19 percent response rate yielding a 93 percent “good” or “very good” rating. Just two responses were not positive (one “fair” and one “poor,” which was rectified). “If I get a 93 percent favorable rating on a brand new process, I’m elated,” Shuter said. That’s not to say the transition has been without some challenges. It is laborious to align processes that are currently done in different spaces, Shuter explained. To solve these challenges, Business Operations has worked closely with other central units, such as HR and payroll, has engaged end users, and has created focus groups and work groups to hone the model. Phase I of the new shared services model officially went live on Aug. 15 and includes the onboarding of graduate assistants, temporary students and student assistants. The launch came after the three-week pilot in five areas – Student Affairs, Provost’s Office, Libraries, SIGS and Arts & Science. “We started with the areas that had the most activity in this space and made enhancements as we moved through the pilot process, wanting to learn things along the way,” Shuter said. Business Operations identified 10 processes to affect based on analysis from 11 workgroups. “We combined some things that made sense to combine, and we broke apart some things. Monthly and hourly, for example, are different conversations, so we broke those apart,” Shuter explained. She admits that there are UofL employees who are anxious about job loss, but assures that is not on the radar.